Composer William Anderson has scored everything from the mid 90's Fantastic Four and Iron Man shows to the recent X-Men: Evolution and Spider-Man series. MAA: How did you get your start with music, and what lead you to television? ? Will: I have always loved playing music - started with trumpet in the fifth grade and have been playing ever since. Now, of course I play guitar and bass and keyboards and percussion and harmonica, and just about anything I can get my hands on. I wouldn't call my self a virtuoso on anything but I am not afraid to experiment and I love music. So that was nice. Since then it has been one job after another. Along the way I met a writer/producer/creator (Rick Ungar) who was developing a show called "Biker Mice From Mars" I had done a few cartoons by then, and I wrote a demo for him showing how I would approach the show - he loved it and called me and told me it was perfect - he had listened to it 28 times! They built a promo around it and we ended up doing 65 episodes and it was a big hit all over the world. MAA: How do you approach writing an underscore to a main theme? Which is more fulfilling? Which does you feel is more an accomplishment/more difficult - writing a theme or an underscore? Will: My approach to a theme in some ways is the same as the underscore � you try to create just the right tone and feel for the show. The theme has a different job � it needs to be memorable and more produced. A lot of work goes into a theme. Many things are usually tried; sometimes the first thing I do just nails it. I spend a lot more time writing and revising and going thru a collaborative process with the producers to get a theme that really establishes the identity of the show. Then traces of it are woven in the underscore. I think the underscore is really more of a challenge � it is so much work in such a short time. It has to be right, help the action, support the animation, match the emotional temperature of the scenes, be well produced and mixed, stay out of the way of dialogue, or support the dialogue, make jokes work, make action action. Some of the production can be easier, in that some of the music is less � like for a show I am doing now, Coconut Fred�s Fruit Salad Island, Mr. Greenrind main theme is from solo Contra Bassoon, so once I find the right riff, I just print it and move on. Well, some of the time anyway. There is a lot more craft and art to doing an underscore. You need to know a lot more about FX, and dialogue and when and how to support things, or when to stay out of the way. But theme writing is hard too � you really need to work hard and long at making everything perfect, like a hit song. MAA: What influenced your music? Can anything of it be found in your work? Will: I have both classical and popular influences. In some of my more specific writing you can look back to Carl Stalling. Electronica artists also influence me, for example I love Kruder & Dorfmeister, and it was great working with John Digweed and Nick Muir on Spider-Man. I love Tchaikovsky and Prokofiev. I see every opera and every Los Angeles Philharmonic concert every year. I keep up with all styles of popular music � I have enjoyed working with rap artists and MC�s in the past. I love Chopin. Mozart. John Williams. I love the Rolling Stones and Nine Inch Nails. I was thrilled when Green Day won the Grammy. Just saw them at the Home Depot Center. I think it is so great they triumphed with their new record. Billy Armstrong and his guys just friggin� killed it. Imagine a 17-year-old punk band selling out a 50,000-seat stadium for two nights. God bless them. I like minimalism, trance house mood music. I like the honesty and production that comes out of Nashville in country music. MAA: How do you approach the difference in style between say, a theme of Earthworm Jim and X-Men: Evolution? Will: So different � EWJ was so wacky and offbeat. I wrote the lyric, snag it, orchestrated it and conducted it. It was funny and wacky and orchestral � like the show. The theme was approved on first listen. It was funny, because I sang the demo as just a demo � and hired an opera singer to do the real lead. When I presented the two versions to Universal I didn�t tell them I was the singer on the one version, because my voice � it cracked and was straining for the notes � but that was the vocal they loved and the one you hear on the theme. By the way, a couple in, I think it was Oregon, exchanged used the EWJ theme song as their wedding march because they fell in love watching the show on Saturday mornings. That was a neat feeling. I sent them the music so they could play it as they marched down the aisle. Iron man is so different � I wanted to do something mostly electronic with heavy beats and synth basses arrpegiated sounds. Angst. Tony Stark is a man with a double life and a lot of angst. The music reflects it. Very precise, mathematical science techno music. MAA: Could you pick a favorite out of everything you�ve ever done? Will: Mainly I love writing and the process of doing shows. I think the theme for EWJ was a stand out; the Astro Boy theme is good, the X-Men Evolution theme and score is good. I like what I am doing now on Coconut Fred, a very unusual out of the box score. I have little breakthroughs along the way that I look back on and smile at, but no overall favorite. The first Biker Mice Theme was dead on. I am always striving to get better. MAA: Slightly off topic, but what was it like to work with Weird Al? Will: Weird Al is great. I scored his television show for CBS, and toured and recorded with him. He is a wonderful guy. He is married and has a child named Nina. His wife is Suzanne. I played on his last album, Poodle Hat. It won a Grammy. He is quite something. Has outlasted many of the artists he has lampooned. Hard-working, great guy. I wouldn�t tour with him anymore because I have morphed into film tv score guy, but I could be persuaded to play my famous trumpet solo on stage at the Greek theatre if he wanted! He is still a friend. We are having dinner next week, as a matter of fact. MAA: With both Iron Man and Fantastic Four, you were taking over shows that already had their own musical styles, but both shows were in dire need of revamps. How did you approach these projects? Will: I listened to the themes and scores and just felt they weren�t working. I didn�t use them for inspiration. I liked Georgio Moroder�s theme for Fantastic Four, it was catchy, but it seemed a little light for the show. I did a heroic march, which I think still stands up, even after ten years. It is on my website if you want to hear it. We sat down with Tom Tataronowic, the executive producer, and mapped out the vibe for each show. The shows fell into place fairly quickly; music wise, and I just did what I do for both of them. I think we were successful in the overall improvement from season one to season two. MAA: You worked on the recent �Spider-Man� animated show that aired on MTV. The show featured 3D animation, rather than the traditional 2D drawings. Did you approach your music different because of this? Does the less restricted camera movements change the way you work at all? I loved Spider-Man and am sorry we didn�t get to make more. The score was a collaborative effort with John Digweed, Nick Muir and myself. They had never done animation before, and reside in England. What changed my approach about the music was collaborating with John and Nick, who do trance music for clubs. Translating trance into animation was quite challenging because the form of trace is very long, and usually in animation you changes styles very quickly. MAA: �Spider-Man� featured a sound not usually found in animation, a combination of rock and dance, yet it managed to fit the tone perfectly. On a similar note, Iron Man rarely featured a traditional orchestral sound. What made you decide to go the non-orchestral route? Will: It was just intuition. No lengthy philosophical debate. It just seemed like the right move at the time. MAA: What do you look for in a character to write their musical themes? For example, what made you use a piano for Magneto�s theme? Will: Yes, piano and solo cello. It just came out that way. When Boyd heard it he loved it right away so we kept it. He is a tragic character, it is a tragic theme. Simple, yet effective. 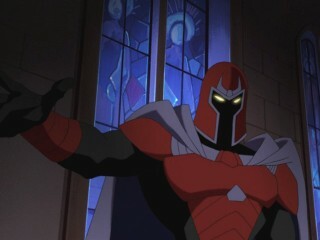 When you heard it, it said Magneto. I use the picture and the character voice as my guide. One of my best qualities as a composer is to have a solid feel for what sticks to picture. I would watch a Magneto scene over and over, trying different chords and orchestrations and melodies over it � when I came up with the harmony and voicing for the piano and cello that ended up being his theme I felt �OK there it is�. I always know when something works. Most of the time I am right, but music is subjective and sometimes your producer will make you change your favorite cue from a show, and you just have to learn to do it and not take it personally. It�s collaboration. Music is subjective. MAA: Did any specific characters that were difficult to write themes for? Will: In what shows? � In X-Evo Storm came easily, you know, Blob was hard powerful but comical � that was hard. I remember writing a weird waltz for him. I am not sure how effective it was. Xavier was hard � I don�t remember having something specific ever for him that just said �Xavier�, like the way Magneto or Toad�s themes spoke. Spike had a good sound, but again, it was more a vibe. Themes don�t have to be themes anymore. Sometimes you don�t want theme. Your want the right mood or vibe for a character. There was also a recurrent motif in the show that just said, �you are watching X-Evo�. MAA: What projects are you currently working on and what can we expect to see you working on in the future? Will: Well, Coconut Fred�s Fruit Salad Island is on Kids� WB! Now. I am scoring show number 8 of 13 as I write this. It�s time slot is Saturday�s 8:30 am. I think it is doing well in the ratings. Krypto is on the Cartoon Network all the time. I will be starting a new season of that after complete Coconut Fred. I just finished the Teen Choice Awards and the Kid�s Choice Awards, which I do most every year. I have some other feature and television shows and original projects that are not animation going on. And do you know what else? Biker Mice From Mars, my first hit show for Marvel, is coming back! We are doing 26 more episodes. Rick Ungar and Tom T. are producing again, and I will be writing the theme and scoring the show. They are shipping the shows now, and the scoring process starts sometime in February. There might be a third season of the Save-Ums!, which I do for The Learning Channel, and I have demos and reels out for several other direct to DVD movies and series. By the way, my studio is part of my instrument. I run a 2.5 GHZ Mac G5 blown out with 8 gigs of ram and over a Terabyte of hard drive space. I have a zillion plug ins. I use Digital Performer for my sequencer, and an ADVC 100 to stream the DV film as I work. I have 8 Pentium 4 PC�s in a machine room that do nothing but play orchestral instruments for me. Vintage microphones and Neve mic pres. Tube stereo buss amps. It is fun having all the toys; it makes it easier and funner to write.